Safely Home, Marines Grieve For Their Fallen Just two weeks after the the 2nd Battalion, 8th Regiment — known as "America's Battalion" — returned home from Afghanistan, family and friends joined them at Camp Lejeune, N.C., to honor 13 members who will never return. "Sometimes there isn't a right answer," Chaplin Terry Roberts told the mourners during the service at Camp Lejeune. A Marine salutes portraits of the fallen. Just two weeks after the the 2nd Battalion, 8th Regiment — known as "America's Battalion" — returned home from Afghanistan, family and friends joined them at Camp Lejeune to honor 13 members who will never return. Cpl. Nicholas Xiarhos wasn't supposed to be in Afghanistan this past summer. But when President Obama visited the Marine Corps base North Carolina in February, Xiarhos knew he wanted to serve in Afghanistan. 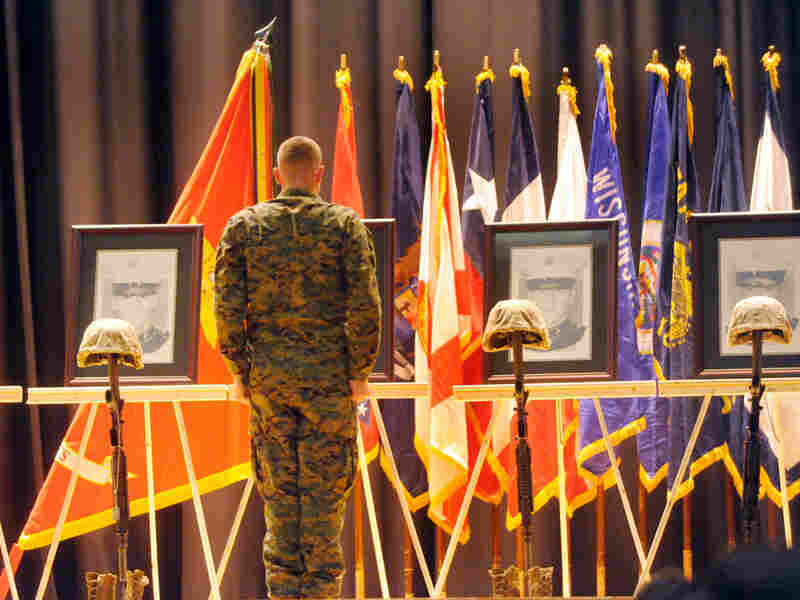 Learn more about the fallen of the 2nd Battalion, 8th Marine Regiment. "He had met President Obama here at Camp Lejeune," Xiarhos' father, Steven, remembers. "Shook his hand, when he came and gave the speech. That helped motivate him. He wanted to go, so he switched battalions." Steven has a portrait of his son tattooed on his right forearm. The last time he saw Nicholas was when he sent him off to war. "The last time I touched him was here, at Camp Lejeune on May 15," he says. "I'll never forget it. And gave him a huge hug, and he crushed me." Back then, Steven had a bad feeling that he might have to return to Camp Lejeune for a more formal goodbye. 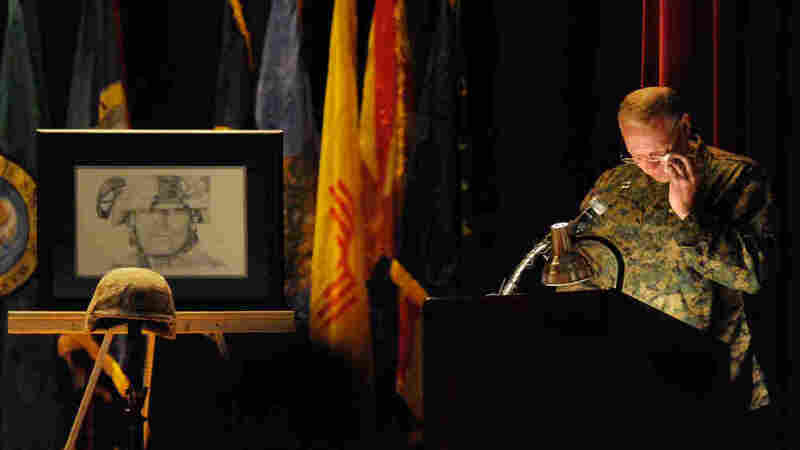 On the stage of an auditorium, a spotlight moved down the line of 13 portraits standing behind 13 rifles draped with the helmet, boots and dog tags of the fallen. 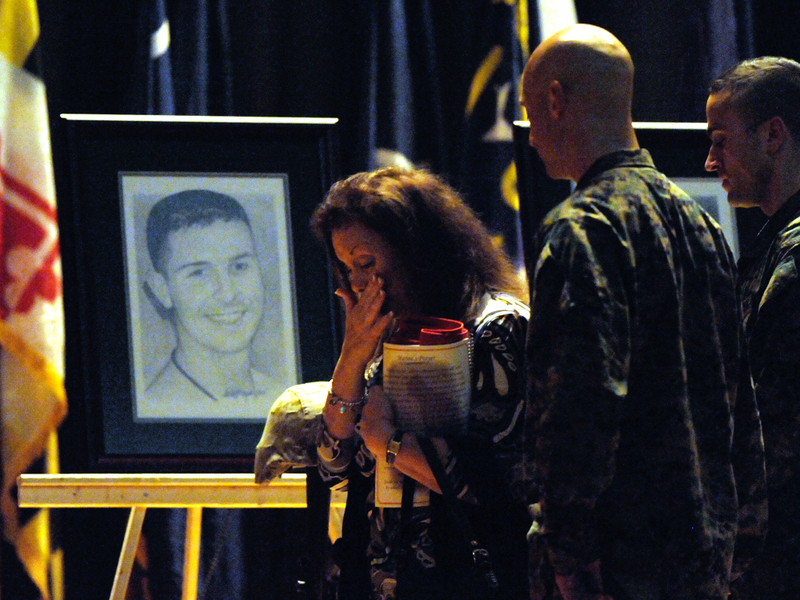 Sobs of grieving parents punctuated the service, while many Marines listened with their heads in their hands. A thousand Marines and family members packed into Camp Lejeune's hall for the service, just two weeks after the unit returned home from Afghanistan. Chaplin Terry Roberts fought back his emotions as he struggled to read the eulogy. "We may be asking ourselves, why did this happen? Why did some return safely, why others did not?" Roberts excused himself for a moment before continuing. "Sometimes there isn't a right answer." The ceremony ended with a farewell as families and Marines walked down the line of portraits. And sometimes there's the guilt of not doing enough. "I do not expect to be forgiven for my failures," commanding officer Lt. Col. Christian Cabannis told the Marines before him. "I alone will carry the responsibility for the losses of the battalion. For each of you who were with our angels on the field of battle, you do not have that worry. I know that you did everything possible for your brothers, even at the risk of your own lives." The ceremony ended with a farewell as families and Marines walked down the line of portraits. Cabannis stopped at each one, pressed his hand on each helmet and lowered his head.